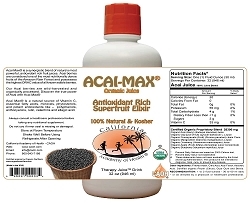 Acai Berry is a rich source of Vitamins and Minerals. Vitamins and minerals are substances found in our foods that are needed in small quantities to support your body's growth and good health. We need these compounds everyday, for several processes in our bodies. In order to get them, we need to eat a variety of foods including fruits and vegetables, which are high in vitamins and minerals. CAOH® Acai is a unique fruit, because it contains a wide variety of these essential vitamins and minerals. Acai is packed with vitamin E, iron, calcium, magnesium, phosphorus and potassium! 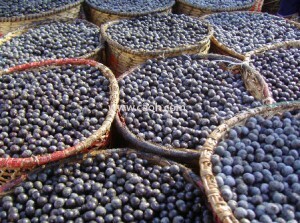 Acai is rich in vitamin E. Vitamin E is a fat-soluble vitamin which has antioxidant properties. Vitamin E protects our cells, especially their membranes from oxidation, or “destruction”. It also helps prevent the healthy unsaturated fats from being oxidized. Iron is needed by our body!s red blood cells to carry oxygen and so it literally helps our cells to make energy. This is one of the reasons why Acai is so energetic! Like other plant derived iron, the iron in Acai berries is not absorbed very well in our bodies. One way to change this is to ensure you have Vitamin C with it. Vitamin C is found in citrus foods and juices. So by mixing CAOH® Acai berries with juice, it helps boost your iron intake! We need calcium for our bones and teeth to develop properly, for their maintenance, and for our muscles and heart to function. Calcium is deposited in our bones and teeth, making them strong. If we do not consume enough calcium in our diet, our bones become more and more porous, which means that a slight fall may break your bones! That is why it is so important to maintain an adequate calcium intake throughout our lives. The new Australian and New Zealand recommended Dietary Intake (RDI) states that we need 1000mg of Calcium per day. 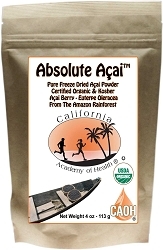 CAOH® organic freeze dried Acai provides you with 51.9mg with every 3 scoops. Magnesium is a mineral needed for our bodies to produce energy. It also helps our bodies in regulating potassium and calcium. It is important in bone formation and muscles. Phosphorus is another important mineral. It is part of our DNA, cell membranes and enzymes, is needed to maintain our bones and teeth strong, and in our body's energy metabolism. Potassium is also a mineral. 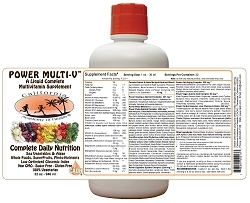 it is invovled in muscle contraction, maintaining a proper fluid balance in our cells, and blood pressure control. Next time you reach for your CAOH® Acai, keep in mind the guilt-free goodness inside that packet of fruit!